Secondary active transporters have been one of the focus points since the inception of the CRC 807. These transporters, classified as symporters or antiporters, are energized by the (electro) chemical gradients present across all living biological membranes and are catalyzing the flux of a wide range of solutes. In the CRC 807, the structures of the BCCT (betaine, carnitine, choline transporter) family members BetP, a Na+/betaine symporter, and the carnitine/γ-butyrobetaine antiporter CaiT were solved at near atomic resolution. 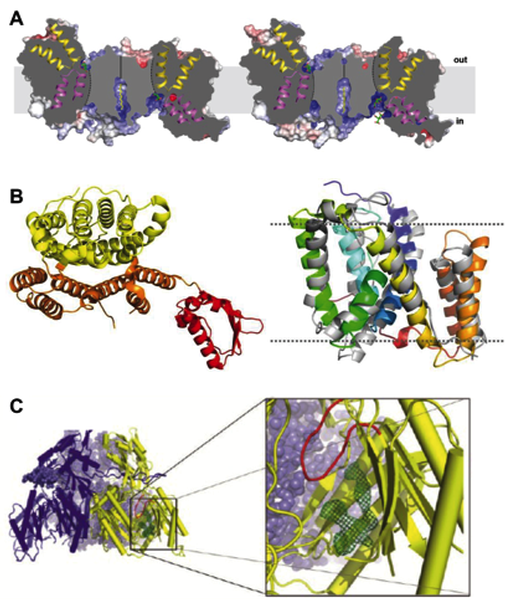 Furthermore, structures of the multidrug and toxic compound extrusion (MATE) transporter family and the physiological active asymmetric state of the drug/H+ antiporter AcrB have been determined by members of the CRC 807. Extending the techniques to pulsed EPR, solid-state NMR, and molecular dynamics simulations to determine structure and dynamics accelerated the research on these transporters. A) The Na+/citrate symporter was solved by X-ray crystallography in three distinct conformations. B) The X-ray structure of an inward-open state of a fumarate/H+ symporter SLC26 member was determined by a nanobody-assisted approach (left: cytosolic view; right: side view). A role in transport regulation of the C-terminal cytoplasmic anti-sigma factor antagonist (STAS) domain (red) is proposed. C) Side view of the asymmetric periplasmic domain structure of AcrB with the indicated inhibitor Fo-Fc density (in green mesh) near the switch-loop (indicated in red) in the deep binding pocket.